Mauritius (French: L’île Maurice, Mauritian Creole: Moris) is a small, multi-cultural island in the Indian Ocean, east of Madagascar, NorthEast of Reunion and southeast of the Seychelles. Mauritius also controls Rodrigues Island and the remote, sparsely populated Agalega and Cargados Garayos (Saint Brandon) islands. The first to colonise the island were the Dutch. They took possession of the island in 1598. The Dutch settlers landed on a bay in the south-eastern part of the island which was named Warwyck Haven after the commander VanWarwyck, the bay is now known as Grand Port. Mauritius also got its name during this period; the island was named after the Prince of Holland Mauritz de Nassau. His father William of Orange, (also know as William the Silent), was the head of the Duch East India Company and forefather of the legendary Scottish Clan comprising the Dukes of Atholl, and the Murray and Smythe families, through Mauritz' sister Charlotte of Brabantina. In 1710, the Dutch abandoned the island, leaving behind macaques, the java deer, sugar cane, fugitive slaves and, also, an irreversible damage to the endemic and indigenous flora and fauna of the island - the Dodo was, by then, extinct due to extensive hunting, the bird being very easy to capture, while the once abundant black ebony tree population was almost completely depleted due to over-exploitation for its timber. The French settled on the island in 1713, also landing at the bay in the south-east. They renamed the bay Port Bourbon and renamed the island Ile de France. They settled on the north-western side of the island and established their main harbour there, Port Louis, the present-day capital of Mauritius. During the French settlement there was a lot of development in the country. Mahé de Labourdonnais , whose statue can be seen across from the harbour in Port Louis, is known as the founder of the capital city and the island prospered under his governance (1735-1746). In August 1810, the British tried to take over the island but lost after a fierce battle against the French in the famous Battle of Grand Port. However, the British came back in December 1810 and successfully defeated the French. From then on, the island was renamed Mauritius and remained under British rule until it attained independence. In 1835, slavery was officially abolished and, as most of the African slaves chose to abandon the agricultural fields and move to small coastal villages, indentured labourers (coolies) were brought in from India (Tamilnadu & Bihar) to work in the growing sugar-cane industry. On 12 Mar 1968 Mauritius became an independent nation within the Commonwealth led by Prime Minister Sir Seewoosagur Ramgoolam. Sir Seewoosagur Ramgoolam, also known as the "Father of the Nation", led the island to independence and did a lot to develop the country. A stable democracy with regular free elections and a positive human rights record, Mauritius has attracted considerable foreign investment and has one of Africa's highest per capita incomes. Recent poor weather and declining sugar prices have slowed economic growth leading to some protests over standards of living in the Creole community. Although Mauritius doesn't have a huge Chinese population, the Chinese Lunar New Year is still celebrated as an official public holiday with red colours and firecrackers predominating. Variable day usually in March, but occasionally in April for the Ugadi New Year celebrated by Telegu from India. Domaine de Bel Ombre — Two-thousand-five-hundred hectares in the south-west of Mauritius, stretching from the mountains to a turquoise lagoon, Domaine de Bel Ombre is Nature's theatre of dreams. Trou d'Eau Douce — located to the east, visitors may easily visit L'Ile aux Cerf from there. Lovely public beach and lots of places to eat. Tamarin - a small town on the west coast, famous for its salt pans. Now popular with expats and hence a range of restaurants and shops. The public beach is at the river estuary. Nearby and a little to the south is a Martello tower and more public beaches but bring a picnic, there are no shops or restaurants there. Pereybere and Cap Malhereux, the hub of the Northern Scuba Diving and Kite surfing industries, with close access to the Northern Islands, where Coin de Mire ( Gunner's Island) and the Shark Pit are both world renowned diving sites. Nationals of Afghanistan, Bangladesh, Iran, Iraq, Kosovo, Laos, Libya, Mali, North Korea, Pakistan, Palestine, Sahrawi Arab Democratic Republic, Somalia, Sudan, South Sudan, Syria, Taiwan, and Yemen must apply for a visa prior to travel. All other nations do not need to apply for a visa beforehand and, depending on nationality, are either entitled to a 90-day visa-free stay or a visa on arrival valid for either 60 or 14 days. For more information, visit the Passport and Immigration Office website. If you require a visa to enter Mauritius, you might be able to apply for one at a British embassy, high commission or consulate in the country where you legally reside if there is no diplomatic post of Mauritius. For example, the British embassies in Al Khobar , Amman , Belgrade , Guatemala City , Jakarta , Jeddah , Pristina , Rabat , Riyadh , Rome  and Sofia  accept Mauritius visa applications (this list is not exhaustive). British diplomatic posts charge £50 to process a Mauritius visa application and an extra £70 if the authorities in Mauritius require the visa application to be referred to them. The authorities in Mauritius can also decide to charge an additional fee if they correspond with you directly. Air Mauritius is the national carrier. Air Mauritius  is the home carrier and operates a network of routes to the local islands and to international destinations in Africa, Australia, Europe and Asia. Regional airlines: Air Austral , Air Madgascar  and Air Seychelles  connect Mauritius with the surrounding islands. International airlines such as Air France , Turkish Airlines , Emirates , Austrian Airlines , British Airways , Condor , South African Airways , Meridiana  and Corsairfly  all serve Mauritius from their home bases. The arrivals hall can get rather congested in the morning when most of the flights from Europe arrive. Immigration officers tend to be rather slow and the whole immigration process can be a frustrating experience. Visitors are required to provide accommodation details to the immigration service on arrival. If you arrive in Mauritius from a country where malaria is endemic, you may receive a visit from the government health service and be required to give a blood sample for malaria screening. Vessels that arrive at the port are mainly cargo ships. The Mauritius Pride and the Trochetia are the Mauritian vessels that usually sail to and from Reunion Island, Rodrigues Island and Madagascar. Costa Cruises ships have recently started an Indian Ocean cruise including a visit to Mauritius. As of April 2008, one way passage prices to travel from Tamatave in Madagascar to Mauritius by boat were €275 first class or €255 second class, compared to €212 to fly from Antananarivo on Air Madagascar. The journey takes at least four days, possibly more if transiting through Reunion. A boat leaves every other Wednesday. The prices quoted are for a passage in a first or second class cabin. In attempting to go directly to the port in Tamatave to negotiate with a boat captain for a non-cabin berth, tourists are turned away at the gate. Visiting the Nautical Club in Tamatave to enquire about yachts that might be heading to Mauritius also yields no results. Bus and taxi services are best used in urban areas. Bicycles and motorbikes are also available for hire. Air Mauritius operates daily flights connecting Plaisance Airport and Rodrigues (flight time - 1 hour 15 minutes). One major highway runs north to south, otherwise a good network of paved, if sometimes narrow, roads cover the island. Traffic drives on the left. Regulations: Drivers are required to be over 18 years old. Speed limits are 110km/h (68mph) on the motorway and 50km/h (31mph) in built-up areas. Seatbelts are compulsory. Foreign licences are accepted. The following chart gives approximate travel times (in hours and minutes) from Port Louis to other major cities/towns/resorts in Mauritius. Several fairly good bus services serve the island. Taking the bus is the most economical way of travelling. Air-conditioned buses have been recently introduced on some routes. Buses are still manned by a driver and a conductor who walks around collecting fares and issuing tickets after passengers have boarded. Tell the conductor where you want to go and he'll tell you the fare amount. Upon payment, he'll give you a ticket with the charged amount printed on it. Most conductors are very helpful in providing directions to tourists. In the local Creole dialect, the conductors are called con-tro-lair (literally controller). Bus routes and schedules are available from the Ministry of Transport  and Mauritius Buses  who list all the main operators and their schedules. Try to pay with small denominations or the conductor may not have enough change. Intentional over-charging of tourists is not common. Taxis are the best way to visit the island. Various tours are available from MUR2500: The holy lake, Chamarel 7 coloured earth, Le Morne, dolphin tours in Tamarin and Ile aux Cerfs are among the most appreciated by visitors. Do not patronise unlicensed taxis. They promise a cheaper ride but, lately, there has been a surge in cases of robbers using this trick to lure and attack their victims. See safety section below. International Charter Group - - Yacht charter and sailing, one of the worlds largest yacht charter companies, can take care of all charter requirements, from bareboat to crewed. Operating from nine offices worldwide (USA, Spain, UK, Germany, Italy, France, Spain, Switzerland, Caribbean, Honk Kong and Dubai). 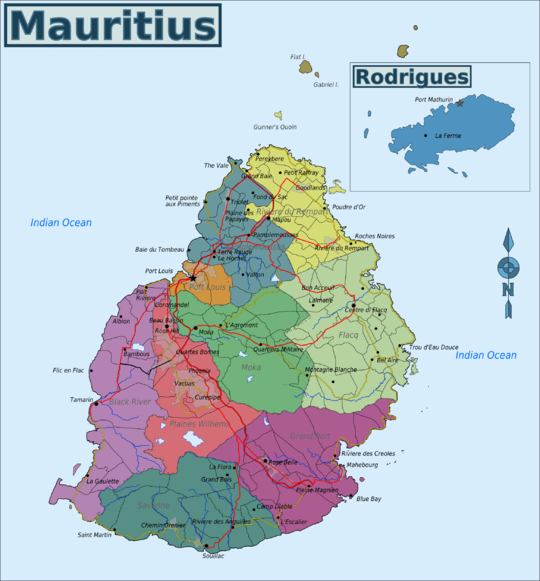 Mauritius does not have an official language, but the main language of government is English. As such, all government administrative documents are in the Commonwealth variety of English, which is also used as the prime medium of instruction in public schools. However, French is the language most commonly used in formal settings, and is by far the dominant language in the mass media, as well as in corporate and business dealings. In fact, even English language television programs are usually dubbed into French. The most commonly spoken language is Mauritian Creole, a French based creole which has incorporated some words from diverse sources including but not limited to English, Dutch and Portuguese, and has slight pronunciation differences from standard French. While there is no official written standard for Mauritian Creole, when written down for informal communication, words are often spelled differently from standard French. The next most commonly spoken language is French, which is spoken fluently by most locals, with English being a not too distant third. Virtually everyone working in the tourism industry will be able to speak fairly decent, albeit heavily accented, English, and all government departments will have English-speaking staff on duty. Tamils constitute around 10% of the population and speak Tamil. Other languages spoken by much smaller numbers include: Hindi, Urdu, Hakka, Telugu, Marathi, Bhojpuri and Mandarin. Grand Bay was the first area of the island to fully experience the tourist boom. A shopping and leisure paradise, Grand Bay is also where Mauritians go when they want a fun-filled night out (restaurants, bars and discos). Recently renovated, La Cuvette beach is well worth a visit. Pereybere — The wonderful Pereybere public beach, voted World's Most Beautiful Beach in 2010 is popular because of its shopping facilities, restaurants and pubs. This is one of the best beaches for swimming. Glass bottomed boat trips, Mangrove forest visits,water skiing and tubing. Eating varies from street food sellers to fabulous restaurants. It is also the launch point for some of the best diving diver training and dive instructor training on the Island and offers accommodation varying from economical self catering apartments to 5 star hotels and beach resorts. It is the focus of Mauritian Life holidays. Balaclava Ruins — Near (a few metres) Baie aux Tortues, which 17th century sailors named after the many tortoises in the area, can be found the ruins of the old Balaclava estate. Visitors can see the sea walls, whose initial foundations were laid down by Mahé de Labourdonnais. The location of the ruins now form part of Maritim Hotel, and public access may not be possible. The Triolet Shivala — The longest village on the island, Triolet offers an opportunity to visit the biggest Hindu temple, the Maheswarnath, first built in 1819 in honour of the Gods Shiva, Krishna, Vishnu, Muruga, Brahma and Ganesha. The Labourdonnais Orchards — Discover a large variety of tropical fruit trees, and colourful and perfumed exotic flowers. Trips on mountain bikes or hiking are possible. The Caudan Waterfront — The Caudan Waterfront and its surroundings has a great collection of local souvenir shops and other foreign brand materials such as clothes, and spirits. In addition to the harbor of Mauritius, you will also find the movie theater, game arcades, and local restaurants. The Bazaar of Port-Louis — Literally translated as "The Market of Port Louis" — here you will find a variety of local snacks and tropical fruits, the cheapest food you will find in the capital city. Numerous shops sell well made traditional crafted objects such as the "goni" basket. Unfortunately you will also find a lot of stalls selling pirate versions of programs, movies and games: they are extremely cheap but still are illegal and do not guarantee quality. You may get a version that is not the original, but created by other than what is stated. Like all crowded areas, be wary of your surroundings and keep your belongings close to you. Food sold on the street may have health issues, but that is, for the most part, rare. If you have any allergies, refrain from eating at these stalls. The SSR Botanical Garden If you want to see some plants originating from Mauritius, then this is the place for you. The SSR botanical garden is the oldest botanical garden in the Southern Hemisphere. It was founded by Pierre Poivre (1719 – 1786) in 1770, contains some flora unique to Mauritius and covers an area of around 37 hectares. It also has several animals, being especially famous for its fish, deer and tortoises, as well as an old replica of a sugar mill. Aquarium Situated near Pointe Aux Piments, this aquarium contains a wide variety of fishes and crabs. You can also see some sharks and turtles in a big tank placed in the aquarium. Stone fish and muray fish can also be seen in the aquarium. Restaurants — Don't hesitate to go to the various local restaurants around the city. Although many of them advertise a specific ethnic cuisine, like everywhere around the world they have their own mix of traditional and local. Fried rice, for example, may be different than your usual experience. Flacq Market — Flacq is one of the most important villages in Mauritius. This meeting point for inhabitants of the East boasts the country’s largest open air market. This extremely colourful market attracts a large number of people. The Waterpark Leisure Village — Enjoy sliding on the giant chutes with family or friends. Relaxation and pleasure guaranteed. Ile aux Cerfs — A paradise for water sports and has one of the most beautiful beaches in Mauritius. You cannot afford to miss this tiny island, delicately poised on the ocean, a real pearl in the Mauritian landscape. Price conscious visitors would be well advised to take ample food and drink, as the only bar and restaurant on the island primarily targets well-heeled tourists. Boats depart regularly from Trou-d'Eau Douce village in the East which has some of the best seafood restaurants on the island. A variety of vessels serve the route including catamarans, yachts and "pirate-ships". Some serve food (usually barbecue, especially seafood) on board included in the price and tend to take a detour to the Grand River South East waterfalls for a visit. The island also has a 5-star hotel (Le Touessrok) and a golf course. Beaches— The eastern part of the island is known for its long sand bank beaches and famous hotels such as "The Coco Beach Hotel" and the 5-star "Le Touessrok". Dutch Ruins — At Vieux Grand Port, the oldest settlement in Mauritius, you can see the ruins of the first Dutch fortifications. Excavation work is under way in a bid to uncover an important part of Mauritian history. Ile aux Aigrettes — As a result of the remarkable work accomplished by the Mauritius Wildlife Fund, the island has become an international standard for the protection of natural resources and endangered species. A few of the world’s rarest birds, including the kestrel, can be seen there. You can also see the extremely rare Pink Pigeon, the Green Gecko Phelsuma and the Aldabra giant tortoise. Mahebourg is one of the main fishing villages on the island. Built on the magnificent Grand Port Bay, it was founded in 1804 by the French Governor Charles Decaën. The Monday markets are among the biggest and best on the island and are held right next to the main bus station. Domaine du Chasseur — ☎ +230 634-5011, (Fax: +230 634-5261). Nestling in the Anse Jonchée hills, the Domaine des Grand Bois has splendid hunting grounds covering an area of 900 hectares. Stags, monkeys and boars live amidst the luxuriant vegetation of the hillside. One can watch a few species of endangered birds, including the kestrel. The Domaine contains four thatched-roof bungalows and a restaurant with a panoramic sea view. Take an opportunity to enjoy a meal of venison. (The view is great and well worth the visit, but the food can best be described as average. The venison is very chewy.) There is a steep hike up the hill from the car park to the restaurant. The restaurant offers a 4wd taxi service which is free if you eat one of their overpriced meals, but if you only want a cup of tea or desert they will slug you an outrageous 230 Rupee per person, for the 5 minute ride. Souillac — A small seaside resort along the rugged coast of the Savanne district. A famous feature is the garden overlooking the sea and named after Dr. Charles Telfair. A popular viewpoint is found at the southern end of the village, right on the cliff top : Gris Gris. Blue Bay — Bluest water and most amazing white sand beaches you will ever see... Take the trip across the island from Port Louis and see what this quiet place has to offer. Very busy with the locals on weekends. Try to go during the week. Glass bottom boats are an excellent outing. Part of Blue Bay has been designated a Marine Park, and the snorkeling trips by boat to this area, offered for sale on the main public beach, are well worth trying. Rochester Falls — Rochester Falls is a waterfall on the Savanne River located approximately 2.5 km from Souillac. It is famous among youngsters who often perform dives into the water below. Flic en Flac — A local fishing village that has expanded to become a popular destination for tourists and expats. Flic en Flac has a very long white sandy beach stretching down the west coast to Tamarin which is enjoyed by both locals and tourists. Scuba Diving is a major attraction here with excellent diving just a few minutes from the beach. There is a reasonable supermarket and a variety of accommodations and restaurants to suit all budgets. Martello Towers — at La Preneuse, Black River, represent the ancient rivalry between old colonial powers and the ingenuity of mankind. They are a milestone in the island’s history; they symbolise the end of slavery and the beginning of Indian immigration. Chamarel — A winding road leads from Case Noyale village to the coloured earths of Chamarel: an undulating landscape of different and contrasting shades of colours. The different shades of blue, green, red and yellow are apparently the result of the erosion of the volcanic ash. The neighbouring waterfalls of Chamarel rise from the moors and the native plant life. The site possesses a rare beauty. An adventure park has also recently been opened at Chamarel. Much of the sand has been souvenired by locals. It is now sectioned off, but is not that impressive. Salt Pans — Owing to the exceptional high level of sunshine the district receives, Tamarin is the heart of salt production in Mauritius. Casela — ☎ +230 452-2828. Situated in the Rivière Noire district, the Casela Nature & Leisure Park stretches over 25 hectares. It contains more than 140 bird species from five continents and is home to many other animals like giant tortoises, zebras, a tiger and ostriches. Activities like walking with lions, Rando Fun (ziplines & hanging bridges), quad, buggy & Segway, a petting farm and many more promise a fun day for the whole family. Yemen — Yemen Reserve may not be the largest game reserve on the island, but there is still lots to see. You will be able to get close to the herds of deer, and admire some splendid species of Mauritian fauna. A few rustic kiosks available in the reserve provide an unobstructed view of the sea. There you can sip a local punch while watching the sun going down. Black River Gorges — This national park of 6,574 hectares (16,244 acres) was created in 1994 for the protection of Mauritius’ remaining native forests. Visitors can enjoy magnificent landscapes, with endemic plants and rare bird species. A trail leads from the Pétrin information centre to an area of typical plant life and to a conservation area. Eureka — ☎ +230 326-4775, (Fax:+230 326-9732). Is an old Creole residence built in 1830, Eureka is an essential place to visit during your stay in Mauritius if you wish to immerse yourself in tropical sweetness. Includes a tour of the colonial house with the opportunity to purchase overpriced textile products, and a tour of the gardens and a visit to the waterfalls below. Ganga Talao - Grand Bassin — Beyond La Marie and Mare-aux-Vacoas is found one of the two natural lakes of Mauritius. It rests within the crater of an extinct volcano. Ganga Talao is an important pilgrimage site and many Mauritians of the Hindu faith walk there during the Maha Shivaratri festival or the night fasting dedicated to Shiva. Gigantic eels live in the lake and are fed by the pilgrims. A walk to the top of the mount beside the lake is recommended for beautiful views over the area known as "Plaine Champagne". L’Aventure du Sucre — ☎ +230 243 06 60. Daily 9AM-6PM . Visit an interactive and ultra modern exhibition situated at the heart of an ancient sugar mill and discover the fascinating history of Mauritius and its sugarcane adventure exposed over 5,000m². Then, let yourself be tempted by their boutique with its unique gifts, souvenirs and tasting of special unrefined sugars as well as local rum. Do not miss the opportunity to relish authentic Mauritian cuisine with refined flavours at their restaurant "Le Fangourin". Free access to the restaurant and the Village Boutique Beau Plan-Pamplemousses. Views — For a spectacular 360⁰ view of Port Louis and the north, climb Le Pouce or ‘the thumb', at 812 m (2,664 ft). It is an easy 2h climb from the village of Petit Verger (near St. Pierre), and takes another 2 hr to walk into Port Louis. Tour the Moka mountains — by quad bike, horse or 4-wheel drive at the accessible 1,500-hectare (3,700-acre) nature park of Domaine Les Pailles. Travel to the sugar mill and rum distillery by train or horse-drawn carriage before dining in one of four restaurants. Deep sea fishing — Mauritius is ideally positioned for game-fishing. Depending on the time of year it is possible to catch blue or black marlin , sailfish , wahoo , yellow fin tuna , giant trevally , dogtooth tuna , bonito , dolphinfish, sharks and many more. The majority of the big game fishing boats are well equipped with VHF radio, mobile telephone, GPS navigation system, radar, radio telephone, safety equipment, Penn International reels, life jackets, medical kits, fire extinguishers, flares, and all related fishing equipment such as fighting chairs and rods (usually 9). You can choose between half day and full day fishing trips . Big game fishing is best on the west coast of Mauritius because the currents swirl around the foot of Le Morne, creating a marine environment attractive to bait fish, which in turn attracts the larger fish. Boats usually accommodate up to 5 anglers and full day trips typically include both breakfast and lunch in the price. Head to Grand Baie — For watersports such as parasailing, an underwater walk, submarine and semi-submersible scooters, or to La Cuvette, a long beach with clear water between Grand Baie and Cap Malheureux, for sailing, windsurfing and waterskiing. Safari jeep trips — The Safari Jeep trip takes place in Yemen natural reserve park on the West Coast of Mauritius. It hosts two of the longest rivers on the island – Rivière Rempart and Tamarin River – and is a haven for all sorts of native and exotic wildlife. The actual size of this natural reserve is of around 4,500 hectares. The Yemen Park is the setting for Safari trips where you will have a thrilling ride and will be able to see many beautiful animals such as Zebras, ostriches, African antelopes, Java deer, monkeys, ducks and geese, and will see extraordinary panoramic views of this breathtaking part of the island. Swim — At the northern beaches such as Trou aux Biches, shaded by casuarinas, Mont Choisy, a 2 km (1.2 mi) narrow white stretch of sand curving north from there, and Péreybère, a little cove between Grand Baie and Cap Malheureux. Scuba diving — Diving in Mauritius is spectacular, with the extremely white sand, ultra blue water, emerging delecated coloured soft coral re-growth massive shoals and dramatic topography with varied and abundant marine life. Most of the dive sites are located in the North, with dive boats launching from Pereybere, Cap Malhereux, Grand Gaube and Trou aux Biches. There are also dive sites at Flic en Flac in the West, in Bel Mare in the East and Blue Bay in the South. The Northern Islands are accessible from Pereybere, with close 10 minute boat access to Coin de Mire, a protected Island where the Djabeda, a spectacular wreck lies. The wall of the Island, the caverns and caves and swim -though passages are exciting dive sites for advanced divers. Confetti Bay is shallow, exquisite and perfect for family groups. Also worth diving is the Cathedral which is located off Flic en Flac on the western coast of Mauritius. Mauritius offers Wreck diving, massive shoals, exquisite corals, large schools of pelagic fish and shark diving. Recently with the re-growth of the coral reefs through a govenrment conservation initiative the numbers of the endangered Green Turtle, (Chelonia Mydas) has increased dramaically. Marine life is colourful and varied. Around the Island are ship wrecks dating back to the 18th and 19th centuries, or some ships sunk more recently which create beautiful artificial reefs. Other dive sites in Mauritius include Whale Rock and Roche Zozo where a pinnacle emerges from 60 metres from the ocean floor, and the submerged crater near Ile Ronde, where a variety of sharks come to sleep during the day. Mauritius is almost completely encircled by a barrier coral reef which is home to many sponges, sea anemones and a variety of shoaling fish and some rare species endemic to Mauritius alone. The Blue lipped Angel, the Mauritian Gregory and the rare orange Mauritian weedy scorpionfish are among these. Macro life is also varied. Diving is good all year round, with very good visibility and a water temperature between 24 and 29 degrees. The Mauritius Scuba Diving Association (MSDA) can provide further information. Watch dolphins — Up-close in their natural habitat off the western coast (Tamarin) of the island. Speedboat — Rides are available from Trou d'eau Douce to the popular island playground of Ile aux Cerfs for beaches, golf and watersports. Or, for a quieter day, a catamaran to the Northern Islands - Gabriel Island, Flat Island and Gunner's Quoin. Hiking and trekking — In Mauritius with breathtaking views of mountains, rivers, and forests. Enjoy a hiking trip through the fields, trekking on a zip line or on a bike, and discover this magnificent nature paradise Mauritius being a volcanic island has several breathtaking summits and valleys to explore on foot. You can visit the Black River Gorges National Park, a 6,794-hectare (16,788-acre) forest, to see indigenous plants, birds and wildlife. Black River Peak trail goes to Mauritius' highest mountain, while the Maccabee Trail starts nearby and plunges into the gorge to Black River. Tandem skydiving — Experience a 10,000 ft skydive in Mauritius. Enjoy a spectacular scenic flight and a visually awesome tandem skydive. Tandem skydiving refers to a type of skydiving where a student skydiver is connected via a harness to a tandem instructor. The instructor guides the student through the whole jump from exit through freefall, piloting the canopy, and landing. The student needs only minimal instruction before making a tandem jump. Watch dolphins — Go on a speed boat trip and watch dolphins in the open sea. You can choose between 2 hr trip, half day and full day trips where you will get to watch with the bottlenose dolphin and the spinner dolphin, which have made of the West Coast of Mauritius a place for them to rest before going to the deep sea for their fishing. Blue safari submarine — See the wonderful underwater tropical fish without even getting your feet wet. Going underwater to 35 m depth on board of a real submarine. You will get to visit a shipwreck, explore the rich coral reefs, and observe and encounter various species of fish. The submarine is air-conditioned with fully transparent-glassed cabin so you will enjoy exceptionally clear panoramic views of the extraordinary underwater world. At 35 m undersea, you may see some rare species and will explore the underwater world just like on any other traditional safari. Sea kayaking — A great way to explore the fine greenery of the lagoons, or the open waters of the Indian Ocean. It is possible to find wide range of sea kayaking trips and packages from breezy, calmer routes, to a few days trip surrounding the island in the deep ocean waters. This is also possible to have a kayak trip to any of the small islets surrounding the main island such as Ile D'Ambre Island. Rodrigues island — Tiny, rugged, volcanic it lies 550 km (340 mi) northeast of Mauritius and is known as the ‘anti-stress' island. The capital, Port Mathurin, is only seven streets wide, with a Creole population. Rodrigues offers walking, diving, kitesurfing and deep sea fishing. Tamarind waterfalls — The Tamarind Falls (also known as Tamarin Falls) are a beautiful attraction of the southwest of Mauritius. These falls are awkward to reach, but no doubt, it's worth the effort. Tamarind Falls on the Interior portion of the island is an incredible string of about 7 waterfalls surrounds by green mountains and is tucked away beyond a sugar cane filled. Bring something to swim in as there are numerous pools beneath certain falls to take a dip in. There are some spots that require getting a little dirty and some traction on your shoes, but it is well worth it. First time visitors would be advised not to go unguided. No doubt this is one of the most beautiful and calmest places in Mauritius, and one of the best places for nature and animals lovers, and for finding exotic plants and birds. La Vanille Réserve des Mascareignes — The park which is home to various species of animals, reptiles and plants is set in a beautiful rain forested valley with natural freshwater springs, full of prawns and fish. It is commonly referred to as ‘The Crocodile Park', for its thousands of Nile crocodiles. It is the only place worldwide to breed aldabra tortoises. There is also a mini zoo of Mauritian fauna where you can find most of the Mauritian mammals and reptiles including skinks, phelsumas (geckos), tortoises, turtles, bats, deer, mongooses, monkeys, pigs, as well as domestic livestock such as goats, fat-tailed sheep and donkeys. At the park shop, you'll find crocodile belts and other crocodile goods. Kitesurfing and Windsurfing — Windsurfing, Kite surfing, Surfing and SUP (Stand Up Paddling) in the Southern part of the Island at Le Morne and in the North of Pereybere at Cap Malhereux and Grande Gaube. You can learn or practice all of these sports in this unique part of the Island Le Morne holds the status of being a UNESCO World Heritage area. There is a beautiful lagoon with standing depth water at the foot of Le Morne Brabant where kite surfing lessons take place for beginners. Around the corner from the kite area there is an ocean facing lagoon where there is also a standing depth water (depending on the tide and waves) where the windsurfing lessons are held. This area has played host to kite surfing world championships and is very popular with kiters and windsurfers alike due to its diverse set of condition from flat lagoon to tube riding waves. The beaches around have people selling refreshments and it is possible to buy anything from a sandwich to fresh fruits. If you have your own equipment and visit this area it is highly recommended to get some safety information about the spot. The world class waves on the one side are an incredible thrill but the currents and local weather anomalies bring challenges so some insight into the conditions from the locals is highly recommended. Shop — Mauritius is not at all like Bali or Thailand. Don't expect the local merchants to be interested in a long bartering game. Many shops will not come down on price at all and even at the markets don't expect more than a 10-20% discount. There are bargains to be had however, many large brand names in the textile world are manufactured in Mauritius and you can often find over runs or slightly flawed items at a fraction of the European prices. It is also a good place to find unique designed jewellery, wide range of hand crafts such as: artificial flowers, model boats, wooden art and more. It is possible to reach the main shopping centers by public transportation, or to take a full day shopping tour which includes a driver to take you to the main centers and handcrafts workshops. One should note that if you go shopping with a driver, there is a grant chance that the driver gets a commission from the shop. Always best to keep the driver waiting for you, don't let him accompany you shopping. Ask the driver for shops he would recommend and go alone and negotiate 20% discount. Mauritius is a paradise for the senses, not only for the eyes with its beautiful landscape, but also for the palate. Gastronomes will find a variety of flavours and aromas inherited from the different migrations through its history. Culinary traditions from France, India, China and Africa, the best-known and appreciated cuisines in the world, have been passed on through generations. Depending on the region, rice or a variety of flat bread called chapattis or roti, called farata (paratha) by the local people, is eaten with curries. The extensive use of spices like saffron, cinnamon, cardamom, and cloves and herbs like thyme, basil, and curry leaves are the common ingredients that provide some powerful, yet subtle, savour. Dal, a variety of lentil soup, are many and varied according to which type of lentil is used; vegetables, beans, and pickles accompany the dishes. Dholl puri and roti, originally an Indian delicacy have become the fish and chips of Mauritians. Biryani from Mughal origins is a dish expertly prepared by the Muslim community, with meat mixed with spiced rice and potatoes. You can buy many snacks on the streets of Mauritius including the famous gateaux piments (a variant of the indian vadai ; literally, chilli cakes), and vegetable or meat samosas (puffs), along with octopus curry in bread. The tomato and onion based dish called Rougaille (pronounced rooh-guy) is a variation of the French ragoût . The dish usually consists of meat or seafood (corned beef and salted snoek fish rougaille are very popular with the locals) and all Mauritians eat this dish often if not daily. Mauritians have a sweet tooth and make many types of 'gateaux', as they are called. The cakes vary and you can find cakes very much like those in France and others similar to Indian sweets like Gulab Jamun and Rasgulla among many others. Check out the queues where the street sellers are selling their type of snacks and the longest queue will probably have the tastiest food on sale and is very cheap. Lunch — For an adventurous lunch of roasted wild boar, duck or deer curry with one of the best island views, try Domaine du Chasseur's alfresco Panoramour Restaurant. This domain is the best place to glimpse the Mauritius kestrel in the wild. Be aware there is a steep hike up the hill from the car park to the restaurant. The restaurant offers a 4wd taxi service which is free if you eat one of their overpriced meals, but if you only want a cup of tea or desert they will slug you an outrageous 230 Rupee per person, for the 5 minute ride. When leaving Mauritius, don't wait until you go through passport control if you want to have a snack. The coffee shop after passport control is not value for money. You would be better off visiting the snack bar before check-in and taking your purchases through with you. Mauritius produces a wide range of cane rum. It is very cheap and is a nice drink when mixed with cola and ice. Don't forget the coconut water with a dash of lime and a splash of local rum over ice. The serious amateur will try to find a bottle of five years old (or older) rum. Worth the price difference! If you are staying in a hotel where the drinks are wildly expensive consider collecting your tipples while you are out and about from the local village shops or supermarkets where the prices are much cheaper. The local beer Phoenix costs around 30 rupees (less than one pound sterling) for a pint. Usually served very cold. The local Black Eagle beer, brewed in Nouvelle France is one to watch out for as well. Definite refreshment to match the sweltering summer heat. Try visiting the Medine Estate Refinery shop at Bambous (4 km from Flic en Flac), on the west of the Island, for a wide variety of locally produced rums and liquors. The cyclone season in Mauritius lasts from December until March. Make sure to check the weather forecast and follow local news if you travel during that time. Mostly, the cyclones should not cause any major concerns if you follow common safety rules and stay inside. The fact that there is no malaria in Mauritius and that crime rates are very low make it the safest country in Africa. But you should still exercise common sense and look out for suspicious behaviour, as you would anywhere in the world. You should still carry and use insect repellent also if there is no risk of malaria on the island. Be a smart traveller. Organize comprehensive travel insurance and check what circumstances and activities are not covered by your policy before your trip. Register your travel and contact details, so that you can be contacted in an emergency. Do not leave valuables in view in your car. Avoid unexpected offers of (seemingly free) guided tours. Ulterior motives are common. Do not patronise unlicensed taxis (taxi marrons). Some robbers use this trick to lure and attack their victims. This page was last edited on 2 April 2019, at 17:28.